I’m breathing a huge sigh of relief tonight. 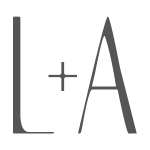 After a few months of one problem after another on the back-end of this blog, everything is getting back to normal and L&A even got a makeover! Do you like it? The home page has the image gallery layout that I’ve always really liked and the same theme has been implemented throughout the blog. Very soon my Recipe Index page will also have a similar look. I’m so, so happy with how everything looks and I have the lovely Kita to thank for it. She is the beautiful, talented blogger behind Pass the Sushi and the recently-launched Girl Carnivore but as you can see, her talents extend beyond cooking and photography. I can’t tell how how much of a godsend she has been, coming to the rescue more than a few times over the last few months. Kita, thank you so much!!! To celebrate, I made a batch of refreshing, fruity, chunky frozen yogurt. It was a little overcast in my neck of the woods today but it didn’t matter at all. 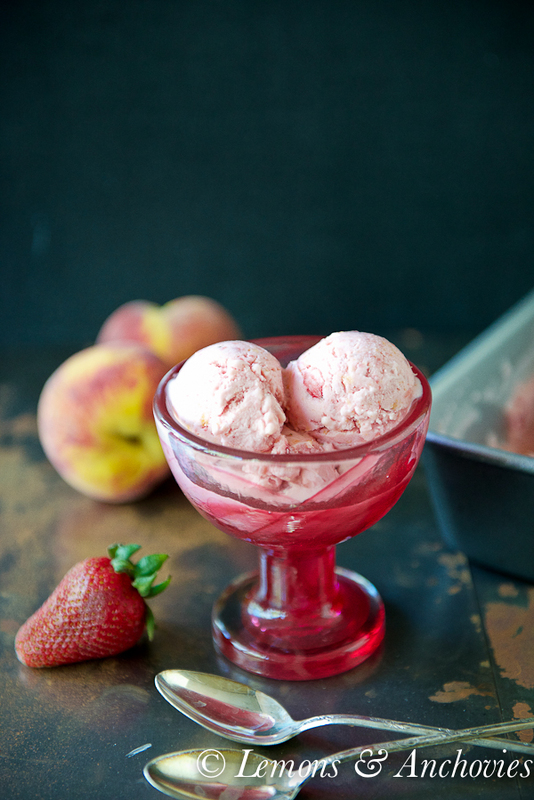 My husband and I really liked the creamy texture of this frozen treat and rather than being overly sweet from too much sugar, I added diced strawberries and peaches to make the fruit really shine. Let the sweetness of your fruit dictate how much sugar to add if you try this recipe but I highly recommend using Greek yogurt. By definition, Greek yogurt is strained so it will lend thickness and creaminess that regular yogurt won’t have (unless you strain it yourself). So get out that ice cream maker and get ready to beat the summer heat with this super easy frozen treat! Beat the heat with this refreshing, fruity treat. Combine the puréed fruit, ¼ cup sugar and lemon juice in a large bowl. Add the yogurt and stir until well combined. A whisk works very well for this. Chill for a few hours before churning in your ice cream maker. Meanwhile, stir together the diced fruit and 1 teaspoon sugar and chill until ready to use. When you're ready for the ice cream maker, stir the vodka into the dice fruit and set aside. Transfer the yogurt mixture to the bowl of your ice cream maker and process according to manufacturer's directions. About halfway through add the diced fruit while the machine is still on and continue to churn. I added the fruit about 15 minutes into the process and continued to churn for another 15 minutes. Turn off the ice cream machine, transfer the frozen yogurt to a container and freeze for a few hours to let it firm up. **Note: This frozen yogurt is not very sweet. There's room here to add a little more sugar, even another ⅛ cup probably won't hurt, but ultimately, the amount will depend how sweet your fruit is to begin with. ***Note: The vodka keeps the frozen yogurt from being rock hard but it's not absolutely necessary. Congrats on the makeover, I love the image gallery! I also love this yogurt, strawberry and peach is such a winning flavor combo! Loving the NEW look! Yippee Skippee! Speaking of loving, this frozen strawberry peach yogurt looks fantastic. Your photos are so pretty. 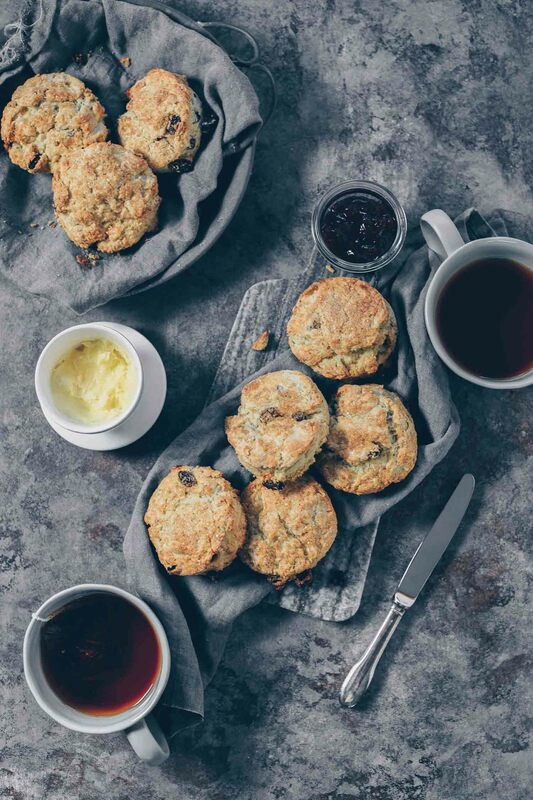 So happy it is almost Friday and I am sure you will be whipping up some more tasty delights! Oh, my. It’s finally hot enough here for frozen treats!!! Time to break out the ice cream maker!!!! Love the fresh new look, Jean! So easy to navigate too! I also adore this luscious frozen yogurt! 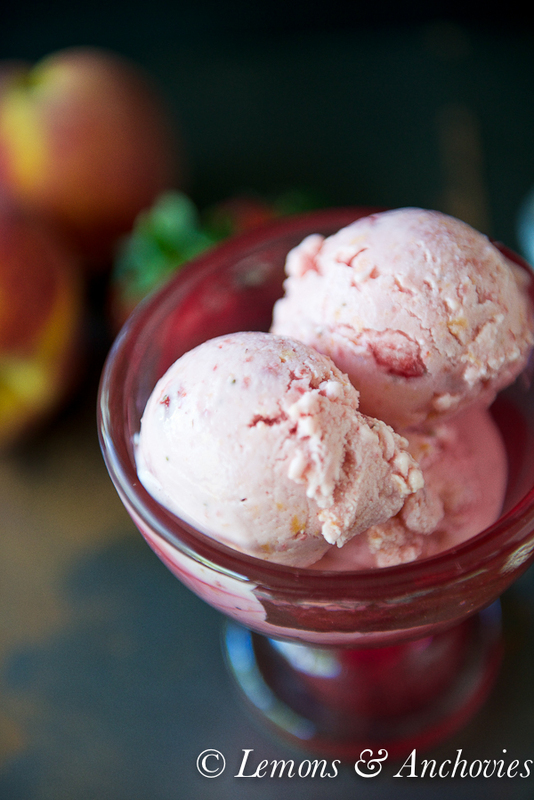 Strawberries and peaches sound like an ideal match. Oh my goodness! What a lovely combination of flavors for a yogurt!! So, this is what you were whipping yesterday 🙂 Lovely! And enjoying the new look too. Looks great over here Jean. Might have to get in contact with Kita to fix all my issues, but not sure if she has years and year, lol. I feel like I’ve abandoned regular yogurt, greek is so much better I can’t go back. I’m ready to pull out my ice cream maker. We should have peaches here really soon. Great new look to your site, Jean! Your photos truly speak for themselves. This frozen yogurt has summertime written all over it. Yum! Hurray! I’m loving the new look, the gallery is fantastic! Go Kita! Question – your ingredient list says to use “1 container frozen yogurt” do you mean Greek yogurt or do you just add your ingredients to pre-made frozen yogurt? DT, thanks so much for catching that typo. I do mean plain, Greek yogurt (not pre-made frozen yogurt). I used nonfat but full fat Greek yogurt would work, too. Sorry for the confusion! My 2 favorite fruits! This looks amazing! And this yogurt sounds perfect. It’s a super dark and rainy today… I could use some cheery frozen yogurt like this! Love the makeover! And what a perfect way to celebrate! I need a bowl of this for breakfast, please. The new look is fresh and lovely. Hello Summer! This is just the treat my kids will love with the fresh fruit and frozen yogurt. I’ll feel pretty good about sharing it with them too. I also read somewhere that strawberries are considered super foods! 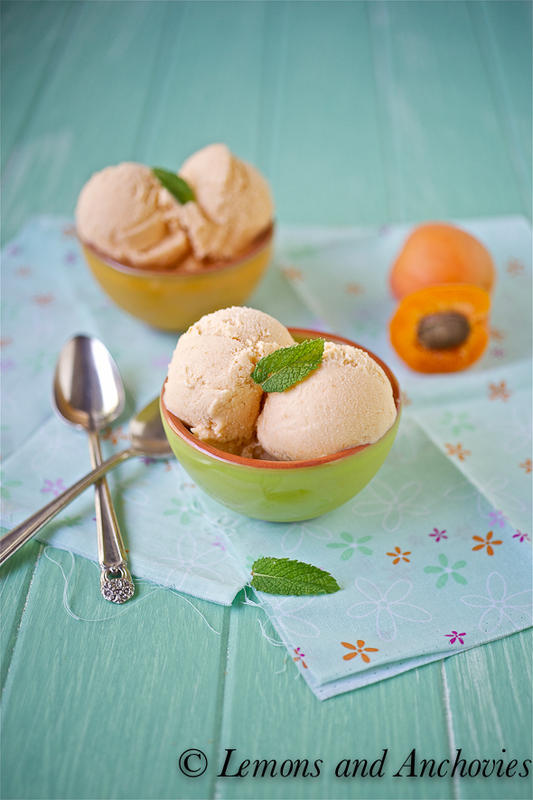 With lots of cancer-fighting antioxidants, it’s a perfect fodder for a frozen treat! 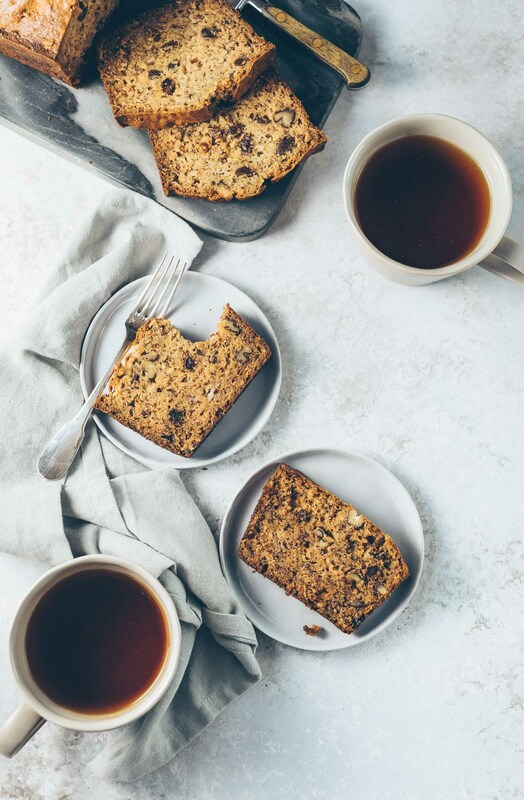 Plus yogurt, especially those with probiotics, makes this a super treat! 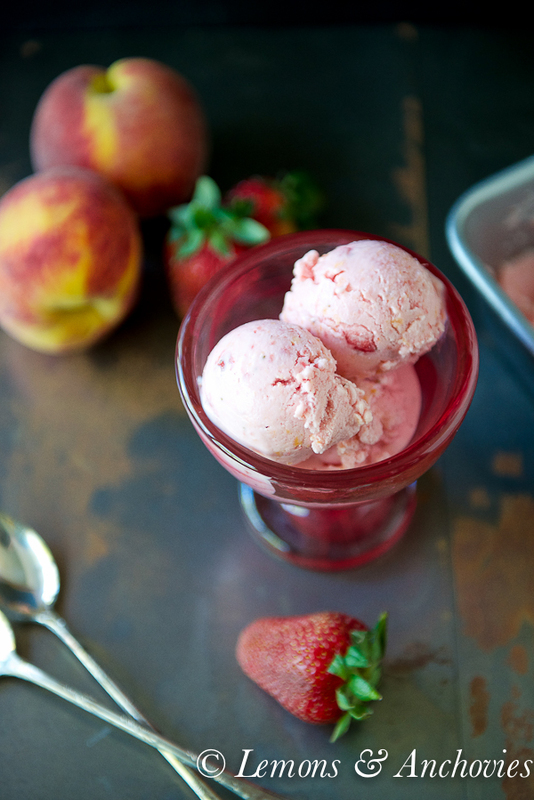 This looks like wonderful recipe for frozen yogurt, peach and strawberry go together so well. What a dream combination of flavors for a frozen dessert! I can’t imagine anything better! Love Kita! She has walked me through issues in the past – and is super talented in the kitchen as well. Glad we are getting to the warmer months, I always love all your frozen treats! This is so pretty and I love the pink serving bowl – and the flavors, mmm, I bet so wonderful!